I have completed my second R/C model and am really excited by it's scale appearance. 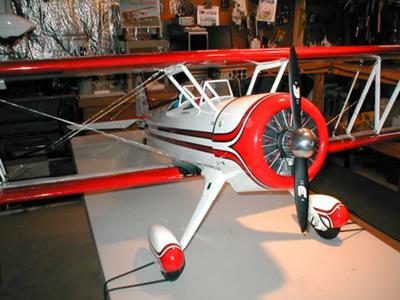 It is a Great Planes Super Stearman with an OS 1.20 engine. Very nice job John, looks sharp! How long did it take to build her? You must have been some long hours in to get finished in the weeks. Do you have a heat gun or sealing iron? those wrinkle should come right out. Don't be intimated too much about recovering. It's not all that hard. The plane looks great! So how does it fly? Are you an experience flyer? Thanks for your response John. I just ordered today the Super Stearman and will be flying it in the spring with the new Saito 3 cylinder 200R3. But maybe we can hook up because I live in the Stow, Ohio area. Sounds like you live relatively close and I'd like to see your Stearman fly. My buddy who lives in North Carolina just ordered the military version of the Stearman with the same Saito radial engine, so we hope to be flying in the spring. What a coincidence as I just ran across this thread! I also have a friend in Stow named Tom, and we are both buying the GP Stearman. Tom is buying the Super Stearman, I am buying the military version. I also hope to install the Saito FA-200R3 radial (hope it is not too much engine). I am located in North Carolina! John, great job on your Super Stearman, and best of luck with your initial flights. If you get together with Tom, tell him I said "Hi"!!! I just bought the same plane wow! it's big and the detail is awesome. 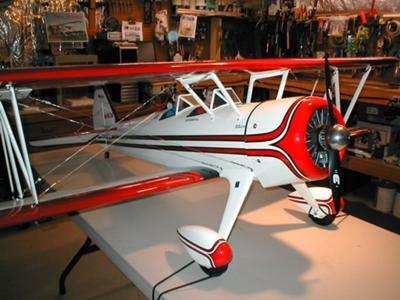 I'm using a 26cc gas engine hope to be up and flying this spring. I'm looking for scratch built tools for my new shop! Beautiful example, although would like to see more info on your flyingwire installation. I picked up this ARF last year and just started on assembly. I too found the covering one of the worst for any ARF so far. Took so much heat to tighten discolored in patches. Plan to fly it for this season and recover with UltraCote, my favoriherete. Will take extra effort to follow the scallop pattern. I also found several areas in the manual for either an earlier or different version as there are differences in wing and aileron joiners and carrying handle, to name a few. Replaced the wing joiners with those cut from aircraft grade ply. Mine will pull behind an OS Gemini 160 twin that fits within the cowl. Also replacing the radial engine front since mine extremely brittle.